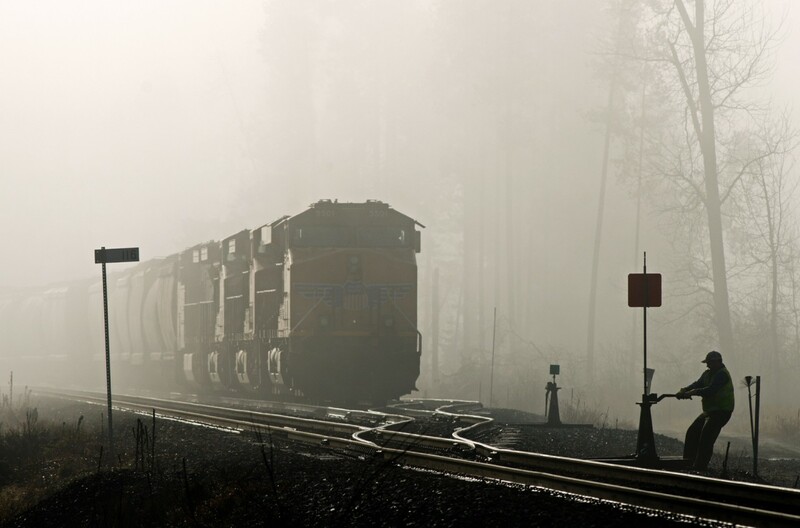 Railpictures.ca - Matt Watson Photo: The morning sun is doing it’s best to overpower the thick fog lingering over Swansea Siding as a conductor “bend’s the iron” at the east switch. | Railpictures.ca – Canadian Railway Photography – photographie ferroviaire Canadienne. Caption: The morning sun is doing it's best to overpower the thick fog lingering over Swansea Siding as a conductor "bend's the iron" at the east switch. Somehow I missed this when it got posted. What a marvellous image!! Agree with the comment that the human aspect adds so much. Great capture! Matt, simply awesome shot. Very moody and well done…the human aspect of this shot adds so much.